Your Lib Dem councillors are campaigning to keep our grit bins. The Council wants to cut them in their budget. We want to keep them! The Council said that Parishes could take them over – but could not quote any costs for filling them! We are campaigning for them to stay in the Council’s budget – at least until their future can be sorted out properly. Thank you to all the residents who took part in our recent survey both on-line and in Focus. The Conservative-run MK Council has done a U-turn and are now saying they will pay for some grit bins but not until April! The Lib Dems have put in bids for bins in Bartholomew Close, Walton Park and for Canonbury, in Monkston Park. We are now submitting a bid for one on the corner of Leominster Gate, Monkston. Grit Bin Success – but not yet! THANK YOU to all the residents who signed our petition to save grit bins. We’ve WON! Following the LibDem campaign right across Milton Keynes, the Conservatives backed down from their proposal to stop grit bins this week. They have now allocated a small budget next year – but it will have to cover both replacing damaged bins and adding new ones. Following residents requests, the Focus team has asked for two more bins – both on steeply sloping roads – one in Canonbury in Monkston Park, and one in Bartholomews Close in Walton Park. The Council have said, again, that we can’t have them at present! Please sign our petitions for these grit bins to let the Council understand how important they are! If you need grit for roads and footpaths in the meantime, then ask for a bag by contacting us, or MK Council on 01908 252353 or email [email protected]. If you need it for your driveways, it can be bought at local builders merchants. The Conservative run MK Council has decided that they are not going to pay for any more grit bins in MK! Worse, they won’t even let the local councillors or parish councils pay either. 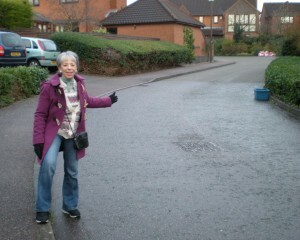 Many residents are left worrying that they will fall over in the first icy weather. The Lib Dems say this is a cut too far! Vanessa McPake had asked for new grit bins in Bartholomew Close, Walton Park and Cloudberry, Walnut Tree but these will now be refused. Disgraceful! Subhan Shafiq is wondering if the grit bin in Tewksbury Lane, Monkston will ever get repaired, put back in the right place and filled with grit! Vanessa McPake checking the existing grit bins in Walnut Tree and Subhan Shafiq finding the bits of the bin in Tewkesbury Lane, Monkston Park.